MANILA, Philippines – After losing superstar point guard Kyrie Irving, Matt Dellavedova filled-in his shoes big time during game number 2 at the Warriors home turf to level the series 1-1, on Tuesday, June 8 (Manila Time) at the Oracle Arena, Oakland California, USA. The Cleveland Cavaliers and Golden State Warriors set a new NBA record for sending finals game into overtime twice. Lebron James tallied a triple-double with 39 pts, 16rebs and 11ast and remained almost unstoppable in all sides of the floor. The 4-time MVP could have finished the game earlier with his driving lay-up during the dying seconds of the 4th quarter but missed it with Andre Iguodala’s outstretched arms in front of him. Video replay showed that Iguodala hit James’ arm but wasn’t called that sent game number 2 into overtime. NBA technical department officials admitted that the referees made a mistake for missing that crucial call along with James’ traveling violation on the 3:30 mark of the third quarter. James might had humongous digits during game 2 but it was Aussie and second-string point guard Matt Dellavedova who had the brightest moment even though he just scored a total of 9 points. The Cavaliers were down by 1 point with 10.1 seconds remaining in the overtime period and Delli grabbed the most memorable offensive rebound of his basketball career off James Jones’ missed three pointer. Lebron James penetrated hard to basket with 15 seconds left in the game clock and found James Jones slightly opened at the right corner for a possible lead and game winner but he missed. Dellavedova who came from out of nowhere outrebounded Harrison Barnes. His tip-in missed but was fouled by Barnes from behind. Delli was awarded with 2 foul shots and sank them both that made him the unsung hero of game number 2. Warriors had a chance to score but Iman Shumpert tipped the ball from Curry’s hand for a turnover. Aside from Dellavedova’s clutch free throws, he made a big part in stopping the MVP Stephen Curry from making long bombs. Matt was tightly guarding Curry and limited the latter in scoring just 19 points and only made 2 out of 15 from the arc. According to the playoff stats, Isaiah Thomas Jr., Derrick Rose, Jeff Teague and Stephen Curry collectively shooting just 24-82 or 29.26% when guarded by Dellavedova which makes him a serious and legit defender. The Warriors had all the advantages over the Cavaliers: home court, crowd support, younger players and healthy line-up but they were not able to leverage on these and fell to Lebron James and Cavaliers’ hands. Now that the next 2 games will be played in Ohio, the Cavs have now the home court and crowd advantages plus and most importantly the momentum. If I were Coach Steve Kerr, I should be worried. They lost to a team with a depleted line-up. It will be a serious and thorough game plan adjustments for the Warriors coaching staff especially on how they can neutralize Lebron James. Lebron James when he was with Miami lost both game 1 in the finals against Oklahoma City Thunders and San Antonio Spurs but still able to get the back-to-back championships. So he’s no stranger in starting slow. His maturity and high basketball IQ helped him carry his team on his shoulders. More than half of Cavs starting 5 are ruled out of the finals due to serious injuries: Anderson Varejao, Kevin Love and Kyrie Irving but James still manages to play well and motivates his teammates not to give-up, not to get depressed and frustrated. 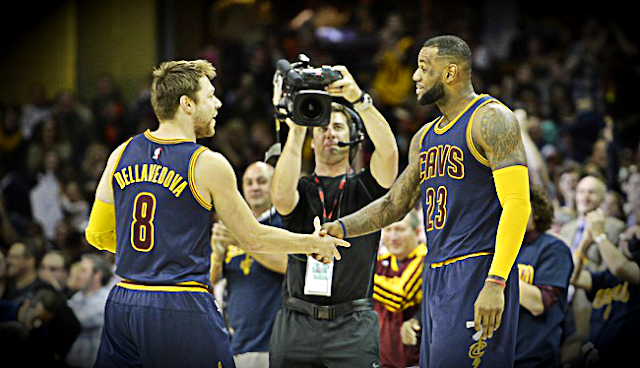 2015 NBA Finals is in a 2-2-1-1-1 format so experts are not closing the series out in favor of the Cavs. Cleveland might win their next 2 games in their home turf, but it will not be over just yet. Anything can still happen. If it’s a 2-3-2 format, Cleveland can possibly end this in their territory. I still pick Cleveland to win the series. If Golden state won game 2, I’ve said this in my last article, they will be the World Champs. Still Cleveland in 6. Game number 3 will be aired live tomorrow on BTV and on a slightly delayed coverage on ABS-CBN. Tip-off starts at 9am Manila Time at Quicken Loans Arena, in Cleveland Ohio, USA. Best of luck to the Warriors and Cavaliers!